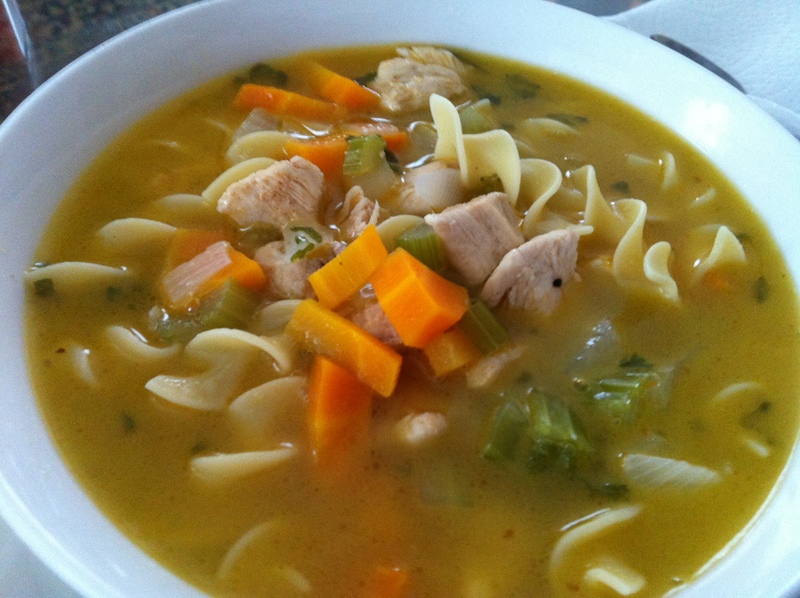 This is a quick recipe for a homemade chicken soup that will make anyone feel better. This is what I crave when I’m feeling under the weather and gets me back on my feet. Dice chicken breasts into 1″ or smaller size pieces to cook and grill easily. Add salt and pepper if desired. In a large sauce pot, melt a tablespoon of butter or more and cook the chicken pieces throughly. Make sure to stir often. When the chicken is cooked, remove from pan and set aside. Do not clean the pot. Raise temperature to medium high and add the 1/2 stick of diced butter. Add onion, carrot and celery and cook for about 5 minutes stirring often. Add the herbs to the vegetables. Once those are somewhat covered in the buttery flavor, add the 8 cups of water. Cover and let boil for about 25 minutes until the vegetables are cooked completely. Add the noodles and cook until the package suggests, usually like 12 minutes or so. When the soup is ready, add back in the grilled chicken and turn off heat. This is where I try it and add salt and pepper or cayenne depending. Once the soup is done you can figure out what it needs. I never add salt before it’s almost done. I usually let it sit for 15-20 minutes before serving. Letting the flavors combine.